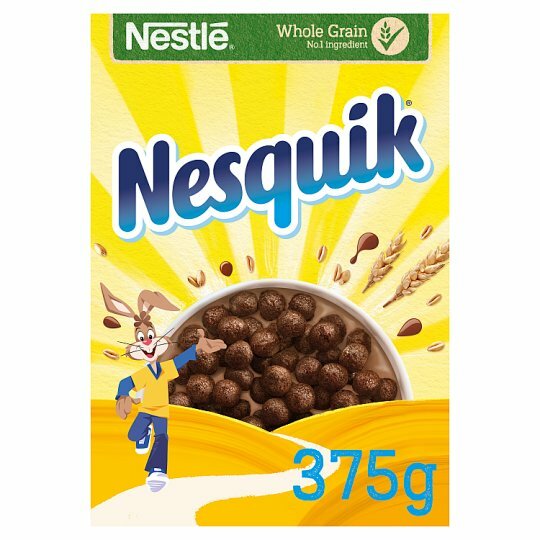 NESTLE NESQUIK is a fun and delicious tasting breakfast cereal that all the family will love. Crispy and crunchy cocoa flavoured cereal balls will turn the milk chocolatey and release that scrumptious NESQUIK chocolate flavour milk for a heavenly breakfast experience. It's made with 45% whole grain and is high in fibre. Contains 9 vitamins and minerals including iron and calcium. That's not all, NESQUIK cereal contains no artificial colours or flavours. Start the day with a smile! Enjoy your bowl of NESQUIK with cold or hot milk, and why not try with a piece of fresh fruit.